To start up one's life abroad is easy for nobody. Besides, also for the fact you need considerable means and, moreover, there is threatening a risk that, because of ignorance you will pay, from time to time, more than you should have to. 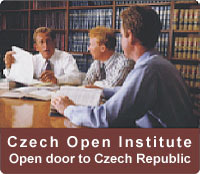 That's why there was, in collaboration with various interested establishments, founded the Czech Open Institute the task of which is to enable the foreigners' integration into the Czech environment. Everybody who will join in any of our projects, will be provided, during the first year of his stay in the Czech Republic, with consultations free of charge in the extent of 5 hours a year. we will offer you Czech language courses and courses introducing you into the history and life usages in the Czech community.